New Quickspin slots game Eastern Emeralds features 1680x bet win multiplier. Quickspin, a subsidiary of the Swedish-listed Playtech brand, has been making quite a few waves lately. 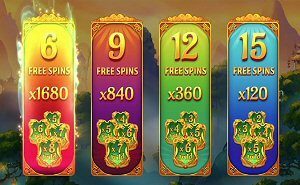 The digital slots firm has been delivering instant-hits like Pirates’ Charm, Volcano Riches, Northern Sky and Mighty Arthur. This month, they’re adding to that collection with the launch of a new Eastern Emeralds Slots. There’s an added element that’s sure to catch the attention of avid slots players who appreciate innovative and lucrative features. 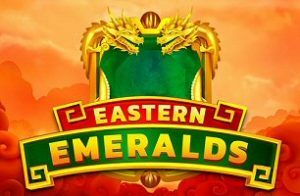 Eastern Emeralds aims to please, packed with the heavy punch of Quickspin’s highest ever slots multiplier. The game is charged with a player’s-choice free spins feature that can pay up to 1680x the player’s bet. Now that’s something to spin about! The games development team at Quickspin found inspiration in the dynamic realm of ancient Asian culture. Based in the deepest wilderness of the Orient and framed by a mystic mountain landscape, Eastern Emeralds is infused with thematic symbols of the era that include mythical dragons, shimmering koi fish and the legendary phoenix. The game is equipped with two prominent features with high payout potential. First are multiplier wilds. The golden Chinese dragon head is the wild, and can appear with a multiplier of x2, up to 7x, the bet. When this happens, any winnings combinations the wild is involved in will be multiplied by that amount. For added profit potential, all multipliers in the new Easter Emeralds Slots will stack. Each choice comes with a variable range of Wild multipliers that can appear. At the lowest level, they include 2x, 3x, 4x and 5x, for a stackable total of 120x. At the highest level, the 4x, 5x, 6x, and 7x multiplier wilds can appear, for a stackable total of up to 1680x the bet. It’s not an easy choice to make. One must weigh the risk versus the reward. Clearly, fewer spins comes with more risk, but isn’t the chance to win up to 1680x your bet worth it? Only you can make that decision. The one thing we do know is that, all things considered—wild multipliers and free spins multipliers combined—this new Quickspin slots game has the potential to pay up to a 20,000x bet multiplier in a single spin! None are more proud of this latest creation than Daniel Lindberg, Chief Executive Officer for Playtech’s Quickspin division. His enthusiasm was shared in a statement following the release of the Eastern Emeralds Slots on July 10, 2018. No doubt Lindberg’s sentiments will hold true in the coming months as more and more players seek out this most munificent new game. The 1680x bet win multiplier isn’t just the highest ever devised by Quickspin. It’s among the highest in the entire digital gambling industry.